Aram Kim is a children’s book author/illustrator and a picture book designer. She was born in Ohio, raised in South Korea, and now lives in Queens, NY, at the heart of diversity, happily surrounded by diverse food and culture. During the day, Aram works at a flatiron building of Manhattan as a picture book and middle grade nonfiction designer for Macmillan Children’s Publishing Group. After designing books about fish who pouts, FBI secret agents, and how whales communicate, Aram comes back home where she works on her own picture books in the evenings. Aram’s debut picture book Cat on the Bus was called a “beautifully designed visual work” by School Library Journal and included in the Children’s Choice Reading List 2017 by ILA/CBC. 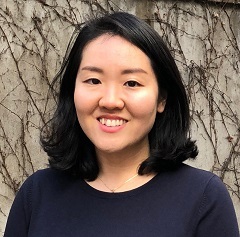 Her next picture book, No Kimchi For Me!, about family, food, intergenerational connections, and a six-year-old “coming of age” has universal themes, and at the same time celebrates Korean culture. It was selected as a Junior Library Guild selection as well as Bank Street’s Best Children’s Books of the Year 2018, and 2018 A Baker’s Dozen: The Best Children’s Books for Family Literacy by The Pennsylvania Center for the Book. Her next picture book, a sequel to No Kimchi for Me! is scheduled be published in spring 2020. Visit AramKim.com.